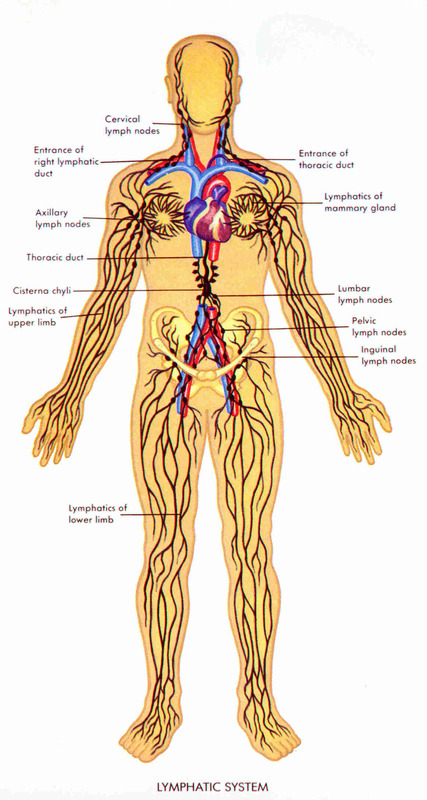 Understanding the lymphatic system can help you to understand lymphoma. 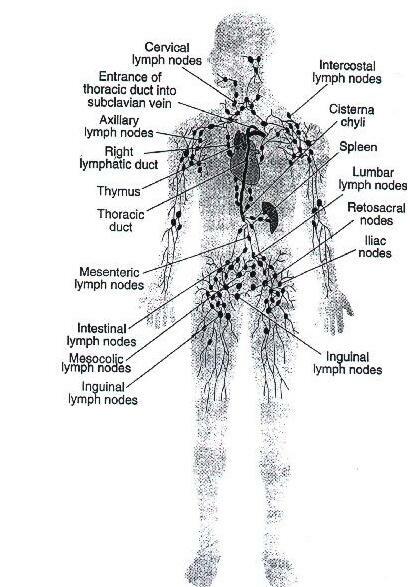 The lymphatic system consists of organs, ducts, and nodes. It transports a watery clear fluid called lymph. This fluid distributes immune cells and other factors throughout the body. It also interacts with the blood circulatory system to drain fluid from cells and tissues. The lymphatic system contains immune cells called lymphocytes, which protect the body against antigens (viruses, bacteria, etc.) that invade the body. See more on lymphocytes below. Lymph organs include the bone marrow, lymph nodes, spleen, and thymus. Precursor cells in the bone marrow produce lymphocytes. B-lymphocytes (B-cells) mature in the bone marrow. T-lymphocytes (T-cells) mature in the thymus gland. Besides providing a home for lymphocytes (B-cells and T-cells), the ducts of the lymphatic system provide transportation for proteins, fats, and other substances in a medium called lymph. "Lymph means clear water and it is basically the fluid and protein that has been squeezed out of the blood (i.e. blood plasma). The lymph is drained from the tissue in microscopic blind-ended vessels called lymph capillaries. These lymph capillaries are very permeable, and because they are not pressurized the lymph fluid can drain easily from the tissue into the lymph capillaries. "Secondary lymphatic tissues control the quality of immune responses. Differences among the various lymphatic tissues significantly affect the form of immunity and relate to how antigens (bacteria, virus, fungus, etc.) are acquired by these organs. Lymphoma is a disease in which malignant lymphocytes grow too fast or live too long. These cells may then accumulate in the lymph nodes or other areas of the lymphatic system to form tumors. When these cells accumulate in lymph nodes it's often called adenopathy - the enlargement of the lymph nodes; but adenopathy can have other causes.